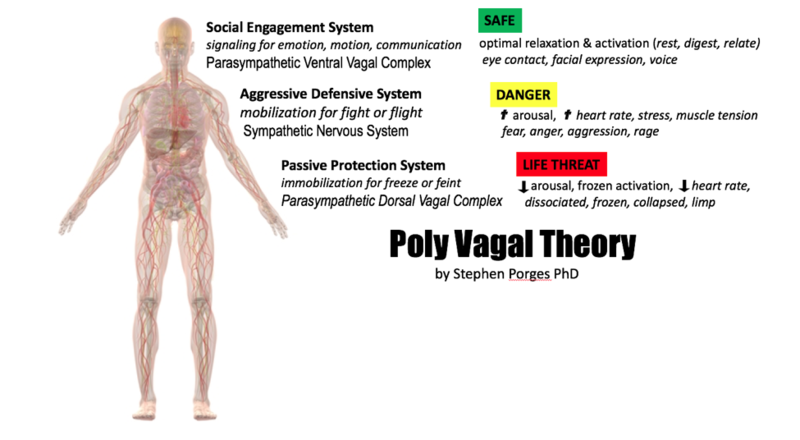 Stephen Porges PhD, proposed the Polyvagal Theory, which links human connection to body sensing states in our nervous system, especially in our face, chest and belly. Dr. Porges directs brain-body research at top psychiatry departments (University of North Carolina Chapel Hill and University of Chicago) and has been Professor Emeritus at the University of Maryland, where he chaired the Department of Human Development and directed the Institute for Child Study. Porges is the first person to ever quantify heart rate variability conducting nearly 20 years of research measuring the heart rate patterns and vagal function of babies and fetuses. Basically he is in expert in how our bodily state affects our psychology and especially in relation to safety and connection. Until 1994, textbooks said the autonomic nervous system only had a sympathetic branch (fight or flight) and parasympathetic branch (rest and digest). However, Porges discovered a third neural circuit that regulates the muscles of the face and head which he calls the “social engagement system” which brain imaging demonstrates that we are able to effectively feel connected to others via eye contact, emotion, touch and communication when our breath and the front of our body (face, chest and belly) are relaxed. Said in another way, connection is a felt sense and if you want to feel connected to others, it happens through a relaxed frontal sensing body so you need to learn to do so. Porges who is both a professor and researcher, has studied reptiles and mammals, human children and adults, integrating brain, body and social relating from an evolutionary perspective across species and has published more than 200 scientific articles across disciplines. Because he has studied both evolution, development and social engagement, Porges understands that each organism reptile, mammalian animal or human has developed various protective survival defenses of such as fighting, fleeing, freezing, or freighting in response to fear, panic or life-threat. When we feel safe and relaxed then our nervous system puts the brakes on these defense responses that protect the vital organs in the chest (tension in the chest to mobilize fighting or fleeing to protect the heart) and gut (tension or numbness in the gut to immobilize. The old model of the autonomic nervous system was that when people were stressed they were sympathetically over-stimulated and when they were relaxed they were in parasympathetic mode, but Porges says this is overly simplistic. He cites trauma and PTSD cases in which people’s body when into depressive numbness, dissociation or shutdown; similar to ancient reptilian who used this immobilization tactic as their primary social defense system. If we feel afraid or unsafe and fight/flight doesn’t get us to safety, our neurological system hijacks us and forces us back into our third, most primitive response: freeze, aka immobilization or dissociation (using the reptilian unmyelinated vagal system). For example, when a mouse is in a life threatening situation of being eaten by a cat and it can’t escape by running away, another strategy it can use is passing out (faint) or playing dead by freezing and in going limp and losing muscle tone, the cat loses interest. This immobilization survival defense actually comes from our reptilian lineages, the turtle can pull its head and limbs back into its shell to freeze and hide in protection and the lizard can immobilize by being very still hoping to blend in with its environment to survive by going unnoticed. Similarly, you might recall a time when you fearfully wished you could be invisible or retract deep inside to protect yourself. So, evolutionarily we have developed protective defenses like immobilization, in addition to fighting or leaving. Many of us know the term fight or flight in relation to stress responses. Porges classifies this as the mammalian defense system which developed as a more functional option—instead of simply freezing in immobilized fear, mammals could now also fight or run away. In the chart above this is called the Aggressive Defense System. Our nervous system is subconsciously continuously sensing to evaluate danger or safety cues, a term Porges calls “neuroception”—a function for, whether physical or emotional in our surroundings and prioritizing behaviors, accordingly. Polyvagal theory emphasizes that potential protection systems are operating beneath conscious control inducing a range of physiological indicators such as sweating hands, increased heart rate, voice inhibition, emotional numbness, facial stoicism, etc. These responses are involuntary, meaning it is not like people want to feel afraid, but some more primal nervous system detection alarms might have been triggered. The guy does not want to feel frozen and speechless when the attractive woman speaks to him, and the public speaker does not want to feel stiff and monotone but their nervous system and muscles in the face and front of their bodies are in fearful protection mode. When we feel safe, we get access to the “social engagement system” of the integrated emotional expressivity of the face, eye contact and relaxed chest with an open heart via the relaxed front of the body and we get fuller access to emotion, vocal range, facial expression and connection. Porges notes that the breath is the primary integrator of safety, relaxation, and social connection because it literally turns on and off the myelinated vagus nerve that relaxes the more primitive protection mechanisms in our nervous systems in the fight/flight and immobilization/dissociation systems. When our body feels safe, the vagus nerve is activated in comfortable homeostasis and it basically slows the heart rate down and calms the body down. Porges compares if your nervous system is safe, and your body is relaxed and socially engaged you can do lots of interesting things. When your nervous system detects risk and fear, you can’t even sitting in a room without being hyper vigilant. When we feel fear danger or life threat whether physical or emotional, the vagus nerve surges in dysregulation either too much activation (fight or flight) or too little activation (in the extreme response people can pass out, urinate or defecate themselves, but in lower levels of a person could experience psychologically oriented constipation, diarrhea or hundreds of other physiological symptoms that Porges and other psychophysiological researchers have demonstrated and documented. So it is NOT just all in your head, on the contrary our body and mind and inseparably linked and emerging research by Porges and other Interpersonal Neurobiology researchers are bridging the connection of embodied psychology. Recalling from previous sections, the muscles and nervous system of our face, chest and belly is the hardware that impacts our connection and social engagement. When we feel safe, the muscles of the chest and belly are relaxed, the defensive shield is down and our system is available for connection which is reflected by our face, referred to as the social engagement system of the 3 frontal areas–also being relaxed which enables us to smile, express emotion and respond via facial expression to communications from the other person, modulate the range of our voice and even be relaxed enough for our ears to listen. The front core of our body (belly, chest and head are literally 2-way instruments for connection. In contrast, when we feel afraid of connection, afraid of someone seeing something inside, afraid of being judged, afraid of not belonging, etc. we put our defenses up and either activate a immobilized freeze/numb/collapse response in the belly or a more aggressive mobilized fight/flight response in the chest—in either case the protective defenses are activated and the social engagement system of connection in the face is off-line. While eye contact is often the first channel of connection people use, research indicates that our inner state when making eye contact can positively or negatively signal availability for connection and affect our state. Ray Castellino, expert in family connection in pregnancy and infancy, cites research that when we look into another’s eyes in a “mutually supportive and cooperative state” it releases feel good bonding hormones (oxytocin) but when a couple look into each others’ eyes in stress, they transfer stress hormones. Connection is not just a mental; it is a felt sense of connection in our bodies. This requires your body have a certain degree of sensing awareness in order to be able to register receiving connection and to send signals of safe availability for connection to another. When we are in a reactive defense state of fight, flight or freeze, our connection instruments are not online for connection. Our own defenses increase our blood pressure, breathing and heart rate while inhibiting our connective eye contact, vocal cords and ears from effectively hearing what someone else is saying. Porges explains that deeper breathing and calming external sounds via music or someone else’s soothing voice can also help relax some of these defensive functions—the intonation of voice not only signals whether it is safe to come closer but also can stimulate your recurrent laryngeal nerve to signal your myelinated vegas nerve (part of the polyvagal system) to calm down and relax your body muscles. Since we are not hooked up to biofeedback equipment we read and sense other people’s friendliness and “available” for connection by their facial expressions, tone of voice and how comfortable they seem in their skin as they stand or move—and for those more skilled sensing instruments the degree of relaxed openness of the chest and the energy they give off. With regards to communication, Porges poly-vagal research tells us that the intonation of your voice produces a field of vibration that is transmitted and potentially received through neuroception that allows your nervous system receptors to turn on and off defensive behaviors as well as receive the full-bodied communication expression of the other. Whether you are conscious of not your body is a sensing mechanism that gives off cues when the communication transmission is being received. But is your presence when speaking deep enough to check? Do you find yourself, speaking for long periods without a breath or response form the other person? Do you get feedback that you talk really fast? Do you repeat the same points over or say the same thing over and over again? Do you go too far in explaining yourself in a discussion? Any of these are signs we could be better checking for understanding. High level attunement in effective communication transmission is like a slowed down, multi-sensory experience, as the expression arises from your whole system (mental-words, emotion, energy, etc.) you sense the authenticity internally and then as it is being transmitted, if you are connected and attuned to the other person you can sense each packet of communication and whether it is relatively received. So you can sense when their system subtly loses attention, get distracted, didn’t understand a word or concept, etc. In the transmission process, either side can have unconscious gaps in presence; you may have had an underlying intention that the listen noticed or you as the expresser had a bundle of frustration underneath your last packet that the listened named so you could feel, release and open into deeper freedom and presence. In communication from deeper presence and connection, the speaker is responsible for attuning to the listener and checking for understanding via sensing a variety of system cues. And on the other end the listen is responsible for naming when he or she lost attention, feels confused or didn’t understand. In a two-person conversational exchange, is there mutual openness in both people system? To what degree and enough to effectively send and receive a communication transmission? Is the expresser open enough to reveal a fuller range of authentic expression and is the listener open enough to listen & receive what is being expressed? Remember effective communication is an embodied experience not just a mental sport. We recall from the physiology science of polyvagal theory, that safety and relaxation are required for our ears, throat, heart and breath to be open. Awe also know that reactive emotional trigger not only affects these the muscle relaxation of the front of the core of the body but also can hijack the limbic emotional brain such that we lose are frontal human adult mental capacities to communicate and listen. In the other reptilian defense mechanism or Stephen Porges theory, we can freeze up, get numb or quiet and shut down. We refer to these as a closed system: which protects us from being physically or emotionally hurt but with the protection we also close off connection and contracted in from the open spaciousness connected to the larger world, it also closes us off to sending and receiving effective communication. Our system is an instrument of experience, in receiving to see, feel & know the world, and in expressing to connect and communicate with others as well as potentially express a unique message or purpose. When our system is open, the expressing and receiving channels are more open and conversely the more closed we are the less we can express and receive from others and life. The more closed someone’s system is the more continuing to communicate with them feels like an effort and can leave the expresser feeling uninterested, frustrated, or depleted; when we contract, close our system, and clamp down on the flow of life through us: whether speech, emotion or subtleties it blocks communication and connection. Whereas during and after leaving a conversation with greater relative openness of both systems, the people can tend to feel more open, energized and connected. Just as a musician tunes his or her instrument first by their own ear and then in resonance with others they are playing with, so too with subtle attunement can we refine our own expression until it is in greater resonance inside and in being received by listeners. Just as a discordant note played on an instrument sounds “off”, so too an inaccurate or incongruent expression can feel off to a speaker or listen with a more refined subtle vantage awareness (see Vantage section for more information). Again this incongruence feels off because the mental words, emotion, and body language, continuing the musical instrument metaphor are not being expressed in resonance. If you have ever had a hyper-mental professor who speaks in a monotonous tone and is boring to listen to, part of the reason is because in turning off and not including emotion and the energy of body language in their expression they are clamping off the aliveness. If we have enough subtle sensitivity we can sense when something about a transmission feels off, when the resonance of the cord sounds off, in the case of an undisclosed intention, an unacknowledged emotion, an inaccuracy, a dishonesty, a manipulation, or a withhold. Even if the listen disagrees upon receiving the expression, there can still be a resonant authenticity of the speaker in the congruence of what they are expressing.